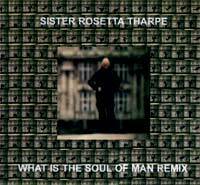 Due to popular demand Document Records have decided to release the What Is The Soul Of Man Remix on a CD single. This will feature the Remix as heard on the Alfa Romeo advert, a track called Cash by Cherry Sheriff (who did the remix) and the original track by Sister Rosetta Tharpe. The CD single should be available at the end of June. If you decide that you cannot wait that long, you can click here to download What Is The Soul Of Man Remix as an MP3.